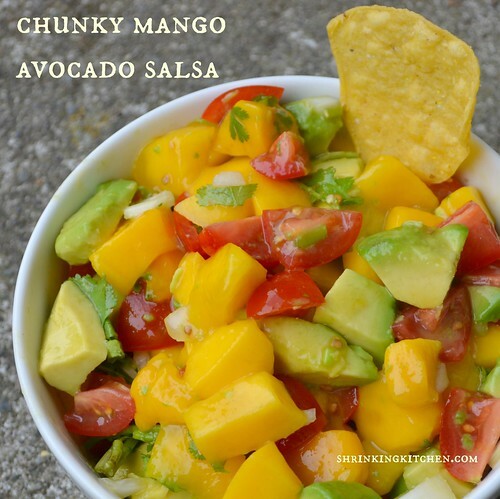 There’s really not much to say about this mango avocado salsa except it is incredible. I mean it. So good and so simple. Perfect for summer. I love avocados and I love mango, so this is pretty much my idea of food heaven. Making this whole combo even better? It’s packed full of superfoods. Mango is bursting with vitamin C. Avocado? Healthy unsaturated fat and nearly 2o vitamins in minerals. Tomatoes are rich in antioxidants, including lycopene. So basically, this is one big health bomb in a bowl. A snack food you can feel awesome about. You could serve this just as you would a regular salsa. With baked chips. In fish tacos. You could eat it with a spoon (cough cough). Tonight, I diced up a little chicken breast and threw it in with the salsa – and had a wonderful mango avocado chicken salad. Delish! Add the mango, avocado, tomatoes, shallot and cilantro to a bowl. Squeeze the lime juice over the mixture and sprinkle with salt. Chill for at least twenty minutes. Serve with baked tortilla chips, over grilled chicken, in fish tacos...endless possibilities! Just ran across your site and had to go out last night to pick up ingredients for this salsa because it sounds so delicious and refreshing. Boy, am I glad I did! Forget the tortilla chips or other accoutrements…I’m eating it straight out of the bowl with a spoon! YUM! This little salsa will definitely be a regular for me. Fortunately, since I’m the only one in the house who likes avocados, it’s mine! All mine! :-) Can’t wait to try more of your recipes.